Trim any excess fat from beef. Discard fat. Cut beef into serving size pieces; season with salt and black pepper to taste. Scrub potatoes. Cut potatoes into quarters. Cut carrots and parsnip diagonally into 3/4 in. slices. Slice celery into 1 1/2 to 2 in. pieces. Place potatoes, carrots, parsnip, celery, onion and bay leaves in slow cooker. Sprinkle rosemary and thyme over vegetables. 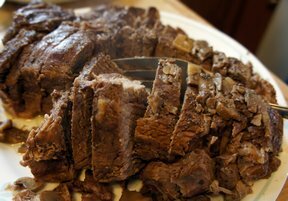 Arrange beef over vegetables in slow cooker. Pour broth over beef. 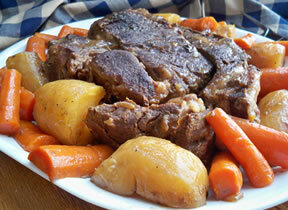 Cover slow cooker and cook pot roast on low about 8 1/2 to 9 hours or until beef is fork-tender. Remove beef to large serving platter. Arrange vegetables around beef on platter. Remove and discard bay leaves. 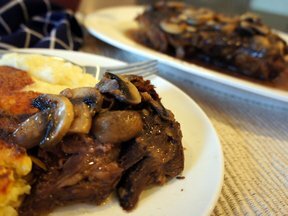 Serve pot roast with juices from slow cooker or with gravy, if desired.